The first thing you should know about Great Smoky Mountains is that it is the nation’s busiest park with more than nine million visitors every year. It covers 800 square miles of mountainous land and preserves some of the world’s most stunning deciduous forests. It also preserves churches, cabins, farmhouses and barns of the mountainous people who began settling in the late 1700s. With 800 miles of hiking trails it is surprising that relatively few visitors actually walk the trails; most choose the scenic view from their cars. But the designated international biosphere reserve is home to an incomparable variety of plants and animals, and is worth a more than a passing by. 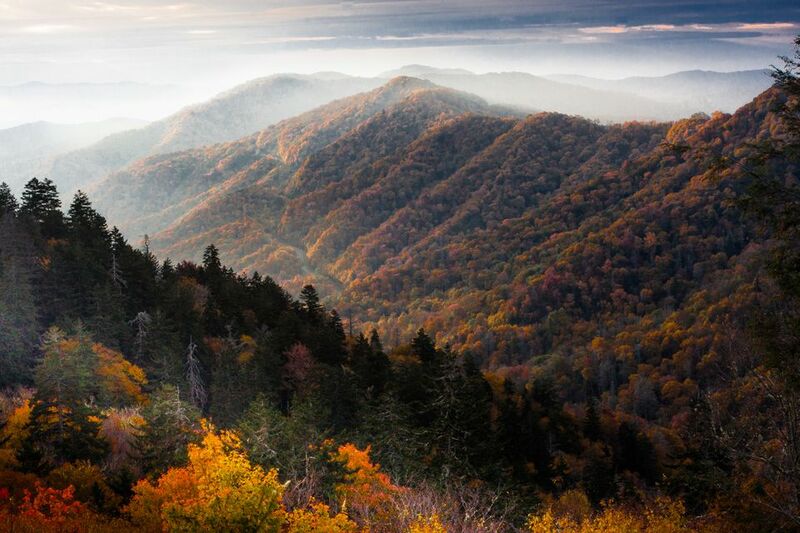 The Smoky Mountains are among the oldest on earth. Ice Age glaciers came to a halt just short of these mountains which have become a junction to northern and southern vegetation. The park preserves are rich in Southern Appalachian history and the mountains have given a home to many people, from prehistoric Paleo Indians to Civilian Conservation Corps enrollees in the 20th century. The park is open year-round and but autumn is by far the most stunning time to visit. But with amazing foliage comes large crowds. Best tip? Plan your trip for mid-week and get there early! If you have the time, a scenic drive is one of the best ways to find Great Smoky Mountains. Take the Blue Ridge parkway which connects Virginia’s Shenandoah National Park with Great Smoky Mountains. Airports are located in Knoxville, TN and Cherokee, NC, both conveniently located to the park. (Find Flights) From Knoxville, take I-40 to Tenn. 66, then take US 441 to the Gatlinburg entrance. From Asheville, take I-40 West to US 19, then US 441 to the park’s southern entrance. There is no entrance fee for the park but those who camp should expect to pay a fee from $12 to $20 per night. Cades Cove is a scenic valley tracing its history to 1850 when settlers moved onto the Cherokee Indian land. Structures and official sites have been marked, creating an outdoor historic gallery. Don’t miss the small cabin known as John Oliver Place or the Primitive Baptist Church which was shut down during the Civil War. Visit the highest point of Tennessee, Clingmans Dome, at 6,643 feet. The peak is accessible by driving Clingmans Dome Road from Newfound Gap, and then walking a half-mile trail. A paved trail then leads to a 54-foot observation tower. Mount LeConte is one of the most popular mountains to hike at Great Smoky Mountains. At 6,593 feet, it is the third highest peak in the national park. Five unique trails lead to the LeConte Lodge which can accommodate 50 guests per night. The Great Smoky Mountains are home to some of the most stunning waterfalls in the nation. Some can’t miss falls include Abrams Falls, Grotto Falls, Hen Wallow Falls, Juney Whank Falls, and Laurel Falls. Overnight backpacking is allowed and permits are required. Reservations may be made by calling 865-436-1231. Ten campgrounds are available from mid-May through October. Cades Cove and Smokemont are open year-round. Elkmont is open April through October. If that weren’t enough, other campgrounds are available on a first come, first served basis. RV sites are also available. Leconte Lodge is located within the park offering 10 cabins and fees include two meals. It is located atop Mount LeConte and may be reached by calling 865-429-5704. Not sure where to stay? Our guide includes hotels, motels and inns scattered conveniently in and around the park. Just 40 miles away, visitors can enjoy the Andrew Johnson Historic Site, honoring the life of the 17th President of the United States. Take a tour of the President’s home – used before and after his presidency – and witness original furnishings and belongings. Travel about an hour away and find the Big South Fork National River & Recreation Area. Over 125,000 acres of free-flowing Big South Fork of the Cumberland River and its tributaries have been protected here. The area boasts miles of scenic gorges and sandstone bluffs and is full of natural and historic features. Nearby North Carolina is home to two national forests – Pisgah and Nantahala. Both offer stunning waterfalls, rich wildlife, and areas to camp. Those seeking a true outdoor adventure should travel to Breaks, VA for a fun day of white water rafting. Breaks Interstate Park features class VI white waters from Russell Fork cutting through the Pine Mountains, thus creating Breaks Canyon.